eDEX-UI is an application that resembles a Sci-Fi computer interface, which creates the illusion of a desktop environment without windows. It's inspired by the DEX-UI project (which hasn't been updated since the beginning of 2015), and the TRON Legacy movie effects. The application uses Electron, and runs on Linux, Windows and macOS. 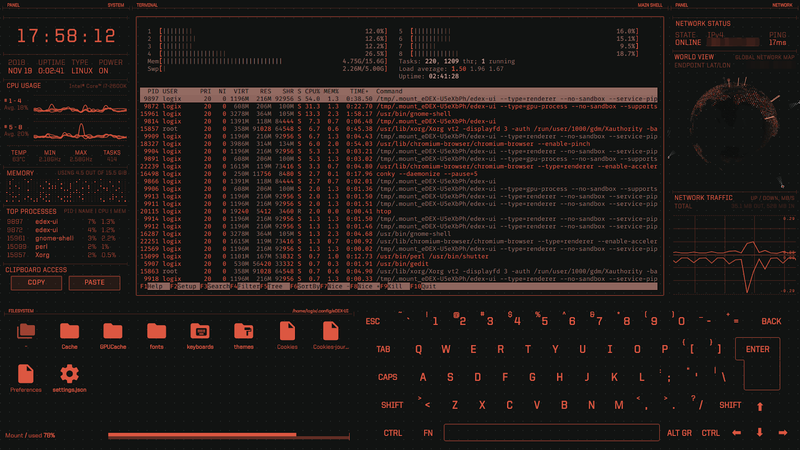 eDEX-UI runs a real terminal and displays real, live system information like the CPU and memory usage, temperature, top processes, public IP address and a live network traffic graph, and more, on top of a movie-like futuristic desktop interface. A file browser is included, which is synchronized with the embedded terminal: navigating to any folder in the embedded file browser makes the terminal navigate to that folder, and vice-versa. 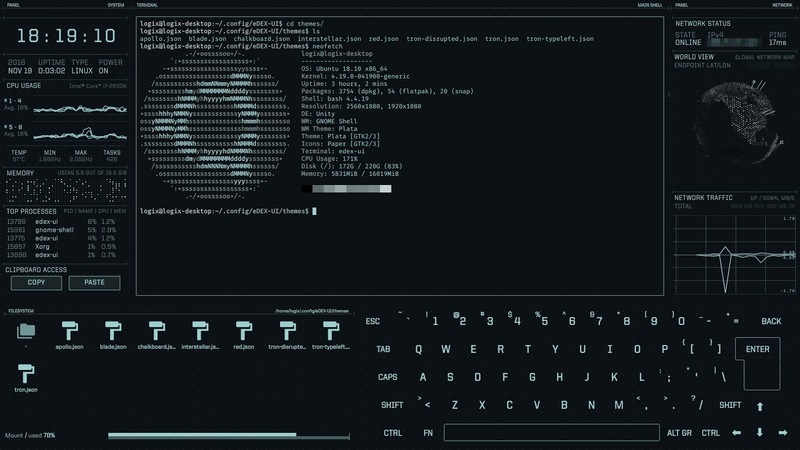 An on-screen keyboard is also incorporated in its GUI, because eDEX-UI is meant to be used with a touchscreen, though multitouch doesn't currently work. The application works without any issues with regular displays - when using a physical keyboard, pressing keys will illuminate the virtual keyboard. As you can see from the screenshot, eDEX-UI uses quite a bit of CPU (htop shows per core CPU usage, so that's not the total CPU usage though), but its purpose is not for doing actual work or monitor your system. 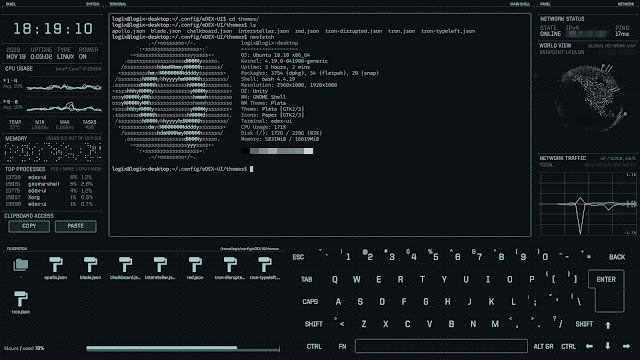 Its purpose is... to make you look "insanely badass" 😁 Use it to impress your friends, customize it and post a screenshot on r/unixporn, etc. If you need a system information desktop widget, you could use something far more lightweight, like Conky. eDEX-UI supports various customization. You can change the shell (default is Bash on Linux and Mac, and powershell.exe on Windows), the keyboard layout, or run it in windowed mode. Themes are also supported, and the application ships with 8 themes, but you can also create your own theme. Visit the project GitHub Wiki page for information on customization. On Linux, the eDEX-UI configuration files can be found in ~/.config/eDEX-UI. A complete changes list is available on GitHub. You'll find Linux AppImage, macOS DMG and Windows EXE binaries on its download page (and the source). To use the eDEX-UI AppImage on Linux, make it executable (right click it, select Properties, then enable executing the file as program) and then simply double click the .AppImage file to run it. You can exit eDEX-UI either by typing "exit" in the terminal embedded in its interface, or by pressing Alt + F4.